Playing golf doesn’t come cheap, from the drivers, iron sets, the gear, each of the accessories are quite expensive and need to be protected against all possible damages. As an avid golfer, one might have to travel a lot and carrying the golf equipment while keeping them safe is of upmost importance. The challenge though is that you won’t be able to sling the club bag into the back of the plane in the same way you would in your car. That’s whee the need for a golf travel bag arise and in this article, we go about reviewing some of the finest golf travel bags for a traveling golfer. If you are looking to shop for the best golf club travel bags online, then this article is also for you. We’ve tried to cover some really good tips to help you find the right golf bag travel cover online. SKB Deluxe’s SKB 4814W is another top travel case designed for traveling golfers. The first thing you will notice in this bag is that it has been contoured in a way that creates even more space. It also features a very hard cover that is a molded version of high molecular weight polyethylene. 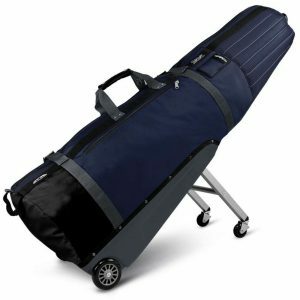 Dimensions: 48.00" x 14.00" x 11.00"
The Sun Mountain ClubGlider Merdian is a travel bag that looks identical to many others but it has a design that any travelling golfer should love. There is a reason why it won the Golf Digest Editors’ Choice for Travel Bags for 2016-2018. 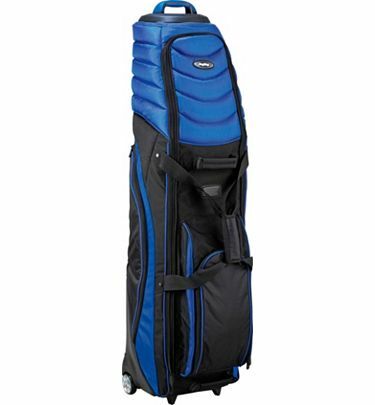 It reduces the hassle of moving around with golf gear plus it has been designed to protect the clubs and last long. This bag has heavy-duty two-way zippers running full length, which is a nice feature in as far as loading and unloading is concerned. There are also two external access pockets that you can use to hold external gear. It is a lightweight bag but its dimension are good for fitting some of the longest of woods in the game. Perhaps the most notable design bit of this golf travel bag is the integrated leg set that can be extended or retracted quite easily. This means extra support and less strain, making it easy to move around in places like airports. Moreover, it has smooth wheels that also makes it quite easy to pull around. In fact, you won’t need to lift it up and down as you load, unload or even maneuver through paths. All you need to do is to literally pop the retractable legs and you are good to go! They call it one easy motion, which is essentially a feature that eliminates the need to keep bending or kneeling to adjust the legs. The only downside though is that you won’t be able to do this in an elevator but the bag is one of the best in making moving super easy. Other than making movements easy, this bag has also been crafted for durability. It is made primarily from ballistic-style nylon with vinyl reinforcements added to in areas prone to wear and tear. The legs have also been protected from overstretching during travels. Your golf club heads will also be protected by a combination of padding in the bag and foam at the top end of the golf bag. It is a lightweight bag but its dimension are good for some of the longest of woods in the game. You can buy the Sun Mountain 2018 ClubGlider Meridian Golf Travel Bag for $295 on Amazon. It has a variety of color options depending on what you fancy. It is an expensive bag, but worth certainly a golf travel bag worth the investment. 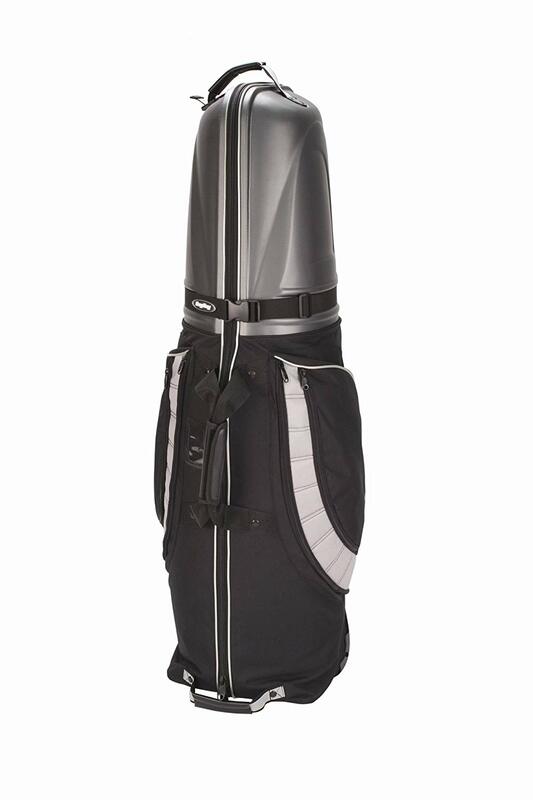 The Bag Boy T-2000 is a golf bag out of the Bag Boy Company brand collection. It is a brand known to experiment with new ideas and this bag is a clear testimony of this manufacturer’s philosophy. In this one, the key feature is a pivoting front handle which twists in tandem with the bag’s position. The feature was targeted at reducing arm and wrist strain as you move around on your golfing travels but there is certainly more that makes it standout. It isn’t the most spacious of travel covers but you will get enough to even throw in additional stuff into the bag keeping in mind that there are extra pockets for shoes or accessories. Perhaps you could use that space like golf shoes, sweaters etc. Moreover, there is a plastic window to hold things like Ids, Business cards etc. The bag isn’t just tailored to reduce strain and ferry golf gear, there are other features that make it a great golf travel bag. For instance, it has a thick cushioning around the top that is meant to offer extra protection to your clubs. The bag is made of nylon just like most other golf bags in the market. The only difference, in this case, is that it uses 1680d nylon. If you don’t what the heck this then it is just a type of PVC mold that is quite strong and durable. It also has smooth skate wheels, stability strap bag strap and tons of other features which will make your transit fun and easy. In matters packing and unpacking, the bag also has a full wrap-around main zipper that takes care of this. You can buy the Bag Boy T-2000 Travel Cover at $190 from Amazon. It isn’t the most spacious of golf travel bags in the market. CaddyDaddy has been one of the players in the realm of air travel bags and they are getting even better! Just as the name suggests, the Enforcer model has been designed to deliver enhanced protection and durability features to a golf traveler looking for comfort and smooth transit. For starters, it has excellent external pockets where you can put shoes though the cover isn’t that spacious with clubs in there. The other nice design feature of the bag is the full wrap-around zipper which isn’t exactly unique as we have seen it in many other bags. That said, it is a nice feature to have in any bag for faster, efficient loading and vice versa. The other positive aspect is that this soft top can fit into the hard top part allowing easy storage when it isn’t in use. It has a crush resistant top which as you might have guessed is super strong. This part offers top notch protection to the club heads as you move. Other than the hard top, the soft body is also fashioned for strength and durability. It is made of 1800D all-weather fabric that will last long. In terms of movements, the Caddy Daddy Enforcer Travel Bag has in-line skate wheels that make rolling seamless wherever you take it. It is also quite portable and easy to carry around as it weighs just nine pounds. It can fit most golf clubs. It is a bit expensive especially for those looking for cheap covers. This is yet another cool golf travel bag from Bag Boy. It is actually one of the best bags for anyone looking to take on a golf trip. It has a unique, hard soft designed that delivers the ultimate protection. This is definitely not all, there is more in terms of protection, durability, space and transit features. This cover can support a max of 51″ club length and a diameter of 10″. Add this to two oversized shoe/garment pockets and the space is pretty good for carrying enough golfing gear. The cover has a blend of a hard top and a soft-sided inside cover that is excellent at protecting the heads of golf clubs on trips. In fact, it is an all-weather golf travel bag as its primary material is 600d polyester that keeps everything dry particularly when travel golfing during those rainy seasons. You have got two nice carrying handles that gives a good grip while on the down side of the bag, there is a smooth inline rolling skate wheels. These ensure that you get a seamless transit and maneuverability in airport settings. You can buy the Bag Boy T-10 Hard Top Golf Club for $180 on Amazon. It has an all-weather happy thanks to the body design. It has heavy but with comfortable straps. It has a couple of extra pockets. 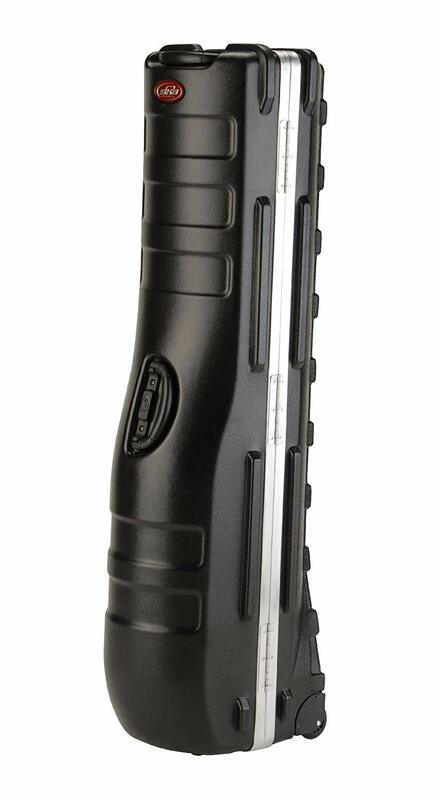 It protects clubs with an ABS hard cover top. It’s only available in limited color options. This cover has been engineered for space or rather, it can fit some bags plus a pair of shoes, carry bags, and drivers. In terms of security, this bag uses TSA Locking System which is ideal for travelers using airports. If you are doubting just how strong is, think of it this way: this is the polythene grade used has been approved by the U. S military for container building and such cases. With this kind of cover and bending tech used in the design, you will surely get a bag with one of the best seals around. This actually prevents dust and moisture from seeping in. It is a big travel cover but quite easy to move around with on a golfing trip. You can buy the SKB Deluxe Standard ATA Golf Travel Case from Amazon at around $192. It is also relatively expensive for new golfers. First and foremost, a good golf club travel bag should be able to protect your clubs. You don’t want your club heads banging on each other right? In that case, you should shop for a bag that offers good protection to these and other coveted extras you want in there. 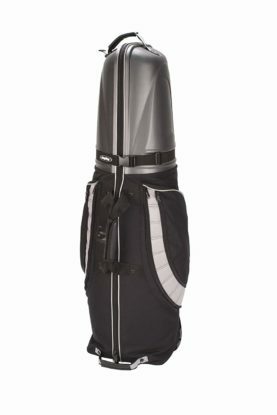 You will need to ensure that the clubs fit in well while the top part of the bag has the right protection cover. You could also go for a cover with padding to help increase the protection cover. Remember, the golf travel bags with wheels will need to protect the clubs from any bumpy handling your luggage may go through in the airport. For better protection, go for a hard case top but again, this will translate to more weight to carry. It is an ideal option for those with bigger cars and vice versa. The point is to find a best hard case golf travel bag that will keep your clubs damage free on your trip. Things can get a bit subjective when it comes to space in a golf travel bag. 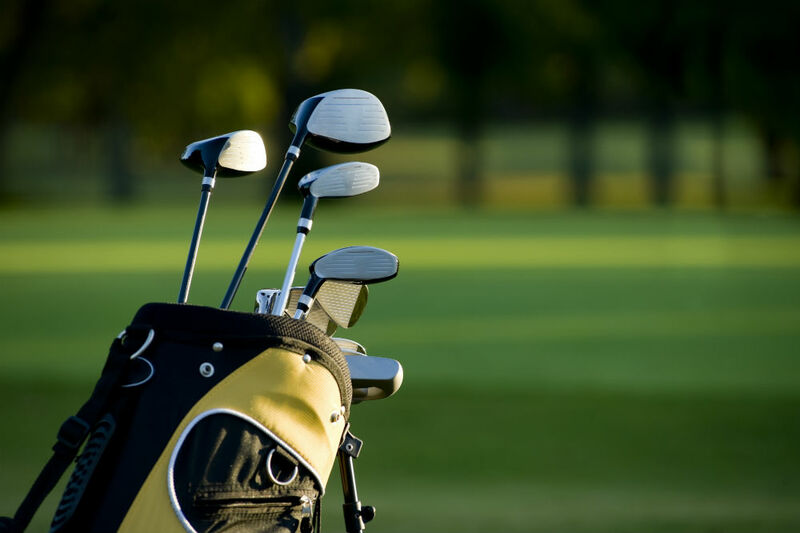 Of course, there isn’t a right or wrong choice in this domain keeping in mind that it all depends on what you want to carry along with your golfing equipment and gear. That said, more space can have a bit of an edge in terms of options but the tradeoff is that it comes with additional weight. Just find a bag with the space that suits you but ensure that the gear and the equipment will be snug fit and comfortable to carry around. It isn’t just about the main space in the covers, there are also pocket options that come with different brands. In other words, find out the one with the right number of pockets that will accommodate your small extras. But again, it is more or less a matter of taste and preference! Ardent golf travelers love one key feature in golf travel bags. Maneuverability. This is a feature that makes it easy to navigate airports without making much of a hassle. Keeping this in mind you should shop for a bag that lets you move around without straining your arms or hands. 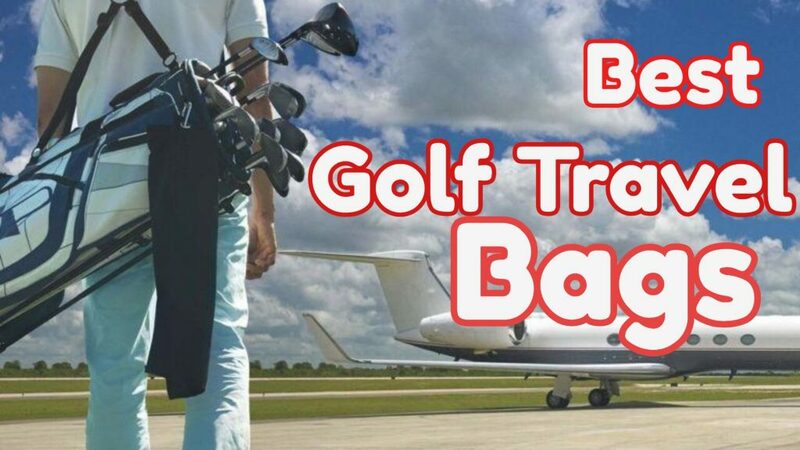 We are talking about the golf travel bag for airlines which something like a golf travel bag with a solid wheelbase, a “standing” posture, nice handles, comfortable straps, and the likes. A cheap bag can be a letdown in this department and you would rather spend more if you want one with more maneuverability. You also wouldn’t want to buy a travel cover that would last just a few trips. This means finding a top quality golf travel cover that is durable, but how do you determine this? The answer is often in the materials used to make the travel bag. Keep an eye on the material and design features implemented to give the bag a long life. Some of the places prone to wear and tear include, seams, zippers, grommets, wheels etc. In the world of golf travel bags, cost is a big factor. Having a cheap bag is the easier option but as they say cheap can also be expensive. It isn’t definite though as you will certainly find some good covers at cheaper prices and still find other expensive ones with very little quality. So, simply look into finding the best cover within your budget range but you need no reminding that golf is a classy sport that requires a bit of investment. That’s about it for the golf travel bags reviews and how you can find the right ones to buy online. There are a lot of other options for golf travel bags, but the models mentioned above are best among the best to rely upon. Hopefully, our quick guide on how to pick the top-rated hard case golf travel bag online will help you out. You can always buy golf travel bags that fit what you are looking for depending on your budget. Just remember that too expensive doesn’t necessarily translate to better quality golf covers. That said, going for extremely cheap options may also not be a wise option.